Every once in a while a film comes along that is so powerful and unforgettable that you cannot purge it from your mind for days or weeks after, or ever. 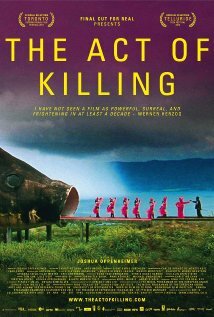 Joshua Oppenheimer’s new documentary, “The Act of Killing,” is one such film. It is a masterpiece, a tour de force that proves one film has the power to force not just a few people, but an entire nation to face the dark truths of its past. And it exists above all, to dispel the notion of good and evil and instead focus on the dialectic between the two;that we are both good and evil, we are human. The directors, Mr. Oppenheimer and an anonymous Indonesian counterpart, along with a crew of mostly anonymous Indonesians–stick around for the credits to see just how many– went around the country interviewing former members of paramilitary death squads that are responsible for one of the largest, most forgotten genocides of the 20th century. They then asked them to make a film about their experiences in any way they desire. What ensued is one of the most surreal, heart-wrenching poignant tragicomedies ever produced for a movie screen. Beginning in 1965 right-wing paramilitary death squads began rounding up members of the recently overthrown, democratically elected government and murdering them. The military, led by general Suharto, with the approval of the U.S. government, murdered between 500,000 and 1.5 million “communists,” union organizers, intellectuals and anyone they felt was a sympathizer of the old left-leaning regime. In an interview on Democracy Now! Mr. Oppenheimer asked viewers to imagine today if the Democratic party was rounded up and exterminated with complete impunity.Today the perpetrators remain unpunished, even celebrated in the country at political gatherings and their local communities. Anwar Congo, one of the main protagonists of the film and considered one of the founders of the right-wing paramilitary group, Pamuda Pancasila, boasts about his crimes and experiences and recreates his own surreal nightmares with the help of other perpetrators. There is a quote at the beginning of the movie by Voltaire, “It is forbidden to kill; therefore all murderers are punished unless they kill in large numbers and to the sound of trumpets.”Adi, one of the explicitly remorseless perpetrators in the film, bluntly states that he is part of the winning side of history and because of that he gets to write his own history of what happened. He makes the point that what he took part in Indonesia was no different than what happened to the Native Americans in the United States. These issues of historical supremacy are juxtaposed with shots of Adi and his family wandering around a modern shopping complex in Indonesia doing the things that all families do. They laugh, look at electronic gadgets and sit in the food court. Knowing what we know about Adi and his role in the genocide; his indifference and conviction, we cannot help but identify with his humanity. The first presumption that comes to mind is that all monsters and sociopaths can pretend to show emotion, but this film illustrates that the truth is much more complex because good and evil are not mutually exclusive. They are symbiotically wrapped in the flesh of human experiences and the collective imagination of an entire people. When watching this film one cannot help–especially if they are American– to contextualize what happened in Indonesia relative to what is occurring in various parts of the world at the behest of the United States. Military forces and private mercenaries are operating all over the world with impunity killing thousands in the name of security from “terrorists,” and this year’s terrorists are last year’s “communists.” Heros in uniform are unabashedly celebrated for the killing they do in their respective country’s name. We make films to lionize them, games to inculcate our youth with their values, plaster stickers on our cars, and in all of this one cannot help but draw a connection with the sentiments of alienation, denial and trivialization that Anwar Congo displays. The ghosts of Anwar’s past are inextricably tied to the ghosts of our past and thinking about the film and what it says about remembrance and reconciliation help one to make sense of atrocity and where it fits in the individual and collective psyche. The film is an exploration into the nature of killing and impunity and the effects such things have on the consciousness of those who commit crimes of the most heinous nature. Do perpetrators feel remorse or guilt when they have committed state sanctioned atrocities in the name of security, flag and country? If the perpetrators are celebrated as national heros, at least for the dominate ruling class and by extension historical account, does feeling guilt or shame for their cruelty begin to chip away at the preponderant historical narrative? The film suggests that it does. Anwar Congo killed 1,000 people with his own two hands and throughout the film his specters rear their heads and he covers them back up with his self-indulgence and trivialities. The end of the film suggests that all of his demons are finally coming back to haunt him in full force and the viewer will undoubtedly be left with more questions than answers. Is he acting for the camera to show the version of him that the film is supposed to portray for the resolution that we all demand? Were his emotions sincere? As he leaves the killing chamber that is now a handbag store the notion that he was not truly remorseful for what he had done is the most terrifying aspect of the film and the viewer, just like Anwar, will be forced to purge that notion from their head because it is too dark to ponder.